Throughout the years, I have devoted numerous Don’t Blink blog posts to Jeopardy. I can’t begin to estimate how many episodes of the game show I have watched in my life. The program is addictive to me. It is a fast-paced 30 minute escape with a basic premise, creative clues, and one hell of a host. What’s not to like? 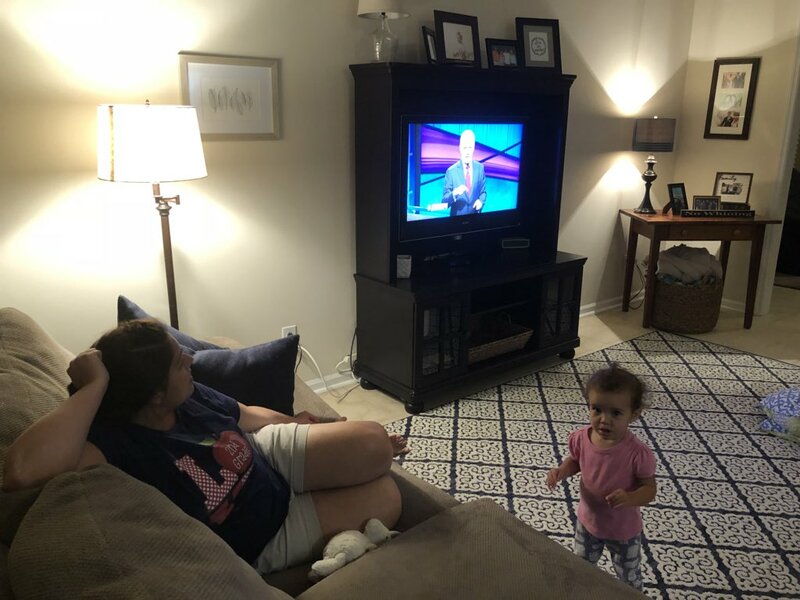 Sidney loves Jeopardy…and it is starting to grow on Sloan. Since our dating days, we have made it a point to watch Jeopardy together. We plan dinner and Sloan’s bedtime routine around it. Once it is on, we don’t accept calls from family or concern ourselves with outside distractions. We sit side-by-side, turn the volume up, make sure each other is comfortable, and…. You got that right. We don’t casually watch Jeopardy. Rather, we go head-to-head to be the smartest of the household, putting full effort into blurting out the answer before the other, many times answering before Alex is even halfway done with reading the clue. Yes, disagreements abound. I answered it before you. Judges wouldn’t accept that. You distracted me. However, the biggest point of contention that would come up on a nightly basis was who performed the best. At the end of the show we would look at each other and argue over “who won” based on who answered the most clues correctly. With no documentation and our own biases, many times both of us would claim victory. It took us long enough but during the summer we finally put an end to the ambiguity: we started to keep score! We have finally reached the point where we tally the questions we correctly answer. Sid and I use a red spiral notebook to document our performances. 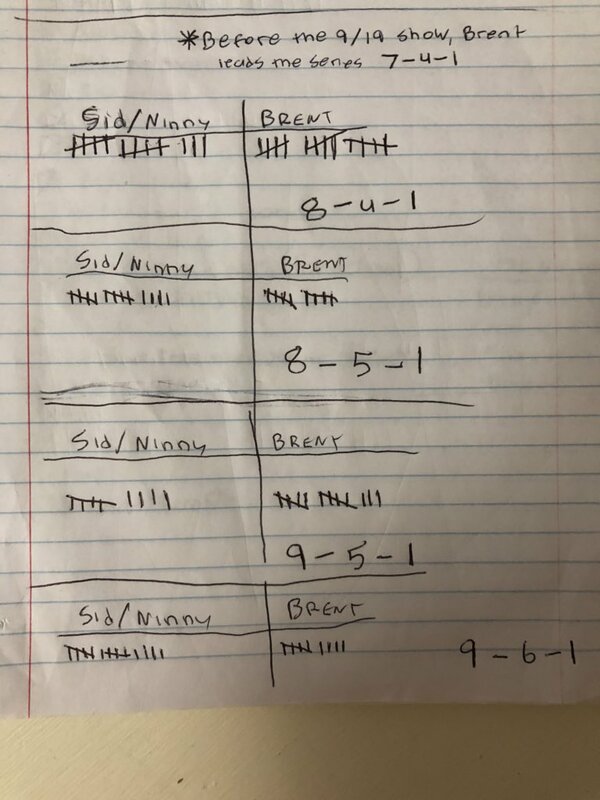 Depending on who is the designated scorekeeper for that episode (we switch off every other night), that person will mark each clue that is correctly answered under the “Sidney” or “Brent” column. After all this time, finally, some clarity. 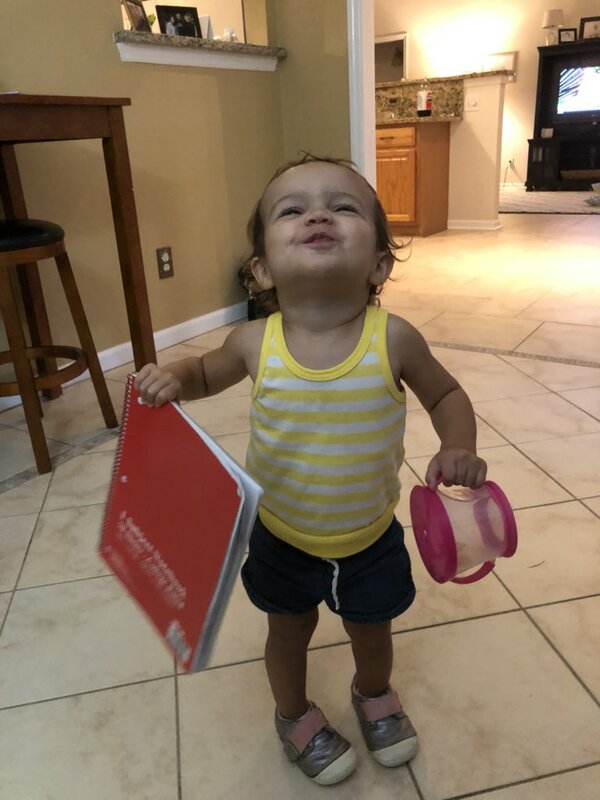 Sloan holding the infamous red spiral notebook. Understandably, we have instituted our own rules. There is no penalty for an incorrect answer. All clues are worth one point each (answering a $2,000 clue will get you the same single point as answering a $200 clue). Daily Doubles mean nothing extra except for the fact that one point is on the line. After Double Jeopardy, the score is final, unless there is a tie. At that point, Final Jeopardy will serve as the tiebreaker (if no one answers it correctly, the game ends as a tie). Thanks to our competitive juices, each night is an intellectual battle in the Reser household. The goal is to win that evening’s Jeopardy episode. However, the nightly episodes are only battles. The war is the all-time series we have set up. At the conclusion of each show, the winner gets a tally mark in his/her overall column. The running total of games won is what the two of us have our hearts set on. A page of our spiral notebook that displays some of our recent games. At the moment, I hold an advantage. The current score is 9-6-1. Thus, out of the 16 episodes we have watched since instituting our scoring system, I have come out on top in nine of those shows. Sid, on the other hand, has answered more clues correctly in six episodes. We dueled it out to a draw early on in the series. If you ever drop by our house during Jeopardy time, we would love to have you play. We will add your name to the spiral notebook and let you compete with us. Just be warned, it gets intense! Don’t Blink. This entry was posted in Uncategorized and tagged Jeopardy by brent. Bookmark the permalink.